Just three days after the announcement of the new MacBook Pro, developers have begun updating their software packages with support for the new Retina display. Until software is updated, text and images are generally pixel doubled, making everything displayed within those apps look somewhat fuzzy on the ultra-high resolution display. Google has built Retina support into the nightly build of Chrome -- a continually updated beta release -- but says in a blog post that the Chrome team has "further to go over the next few weeks." Retina support will also be added to multi-format video player VLC in the next release of the software, version 2.0.2. This way, both video and subtitles or other overlays will be rendered at the display's native resolution leading to a greatly improved viewing experience. If you're one of the lucky guys to have a MacBook Pro with Retina Display already, you're welcome to check out tomorrow night's nightly builds (CEST). When the MacBook Pro with Retina Display was announced, Apple disclosed that it had been working with major developers like Adobe, Autodesk, and Blizzard to enable Retina support in their apps, but it will likely take some time for major apps to gain Retina support. Macs are in the minority for PC marketshare and this new MBP is a minuscule part of that small percent. But it's making everyone jump. Don't you think that eventually all computers across all brands will move to very high resolution screens like this? Enhancing the apps now only makes good sense for the future. Your videos arent going to be sharper which is 99% of the reason why you use VLC. EDIT: I guess I wasn't clear. I meant that their rendering doesn't benefit from built-in text rendering, but they added support for retina fast enough. Yes, but no one did any of it before this MBP came out. Apple is usually a leader in the industry towards the future. But Apple's actions are the ones that actually get the ball rolling. I never meant that it would not have happened without Apple- but Apple's product is what made Google, Adobe, etc. start pushing out these updates. You really don't know what you're talking about, do you? Windows 7 has a whole architecture set up to let apps use HiDPI elements and display at any arbitrary DPI you might choose. If the developer has chosen to include calls to the HighDPI user interface (which were available in Windows Vista, too), then their programs will run with high-res visual elements. If not, then Windows will scale low-res screen elements the exact same way that 10.7 does on a new MBP Retina display. The difference is that you can pick whatever DPI you want in Win7. There are some defaults (the highest default is 144dpi), but you can edit those to be anything (including 220). Windows 8 will apparently be just fine with the Retina MBP out of the box, per AnandTech (http://www.anandtech.com/show/6008/windows-8-on-the-retina-display-macbook-pro). Or are OS X apps getting blurry text on HiDPI, even when the OS is rendering the font? So what you're saying is that Microsoft went out of their way to give developers the tools they needed to make High-DPI apps, and developers ignored it and kept doing things the old way. Reminds me of the companies that were still using PPC-dependent installers for printer drivers or OS X apps for 10.6! 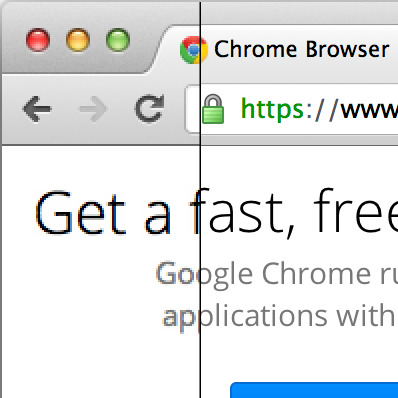 Too bad even the mouse cursors look hideous in Windows at anything above 150% in their DPI scaling. They can't even get the basics to behave well. Whereas every scaling mode that OS X exposes looks pretty darn great at the moment.